Now, since I have so much cash and am at the Tri base for the first time, I thought I'd buy a Medusa and an Apogee. I'll add another Medusa to the fleet when I have the cash. I have no idea how to configure these guys, since these Tri weapons are all new to me, mostly. 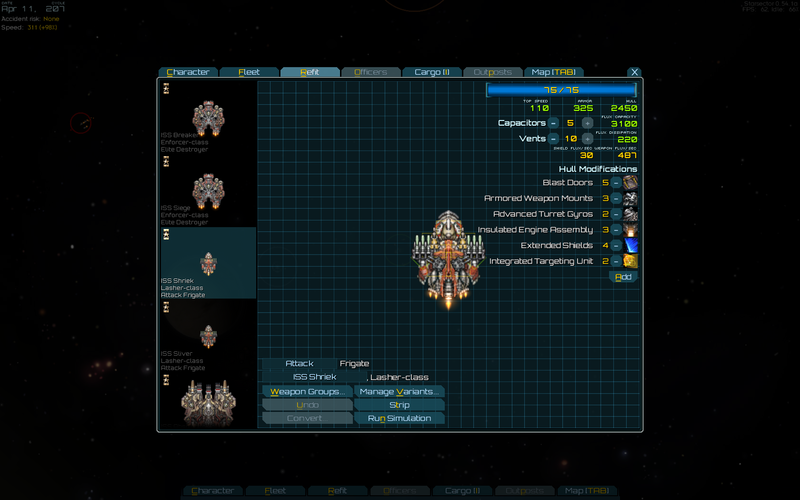 I realyl have no idea what weapons should be autofire and which shouldn't (especially for AI controlled ships), how to determine which weapons are better for which slots (other than how many ordinance points it uses), and how many vents and caps I need. Everything I've done so far has been guesswork. Sssooooo... thoughts on my current loadout, and what I should do with the new Medusa and Apogee? Any other info I can provide that would be helpful, like screen shots or something? For AI use, it does not matter if a group is marked autofire or not. It matters a great deal what weapons are in which groups, however - I've had cases where the AI simply refused to fire certain weapons, and re-adjusting weapon groups fixed that. Generally, this is easy to test using the simulator from the ship refit screen - go in, put up some opponents, and put your ship on autopilot (default key is 'u', I think?). LR PD Lasers are generally a bad choice - there are some situations where they work well, but most of the time you're better off with tactical lasers... which aren't PD at all. For the Hammerhead, I'd suggest replacing the LR PD lasers with tactical lasers... and the PD lasers with Burst PD lasers; it'll give you better overall protection from missiles, and the tactical lasers are decent anti-fighter & support weapons. 1 heavy needler, group 2, autofire defaults to on - with the note that you'll turn autofire *off* during combat if you're getting high on flux, facing an overloaded or otherwise unshielded target, etc. 2 tactical lasers, front turrets, group 3, autofire - you'll only turn this off if you're up against something with decent shields, in which case they're not worth the flux to keep them online. Usually I'll just leave them on. 2 burst pd lasers, back turrets, group 4, autofire - leave this online basically all the time. - and, yes, nothing in the small missile slots; I'd rather spend those ordnance points on vents, capacitors, and hull mods. Your mileage may vary, but I tend to find the heavy mauler is strong enough that you don't really need missiles. Eagle: As with hammerhead, you probably want to upgrade to heavy maulers & heavy needlers when you can (limits including cash, available guns, available ordnance points). Mining blaster probably best dropped - very flux inefficient, and the eagle doesn't have that much to spare, plus the antimatter blasters & heavy mauler both nicely cover the high-per-shot-damage armor-cracker niche. I'd suggest graviton beams for the three medium turrets - they're highly efficient, good anti-fighter weapons, and generally pretty effective at putting pressure on shielded targets; with those installed, it might even be worth considering switching main guns to 2x heavy mauler, 1x heavy needler. And, last, burst PD - at least for the rear two turrets that are covering your engines. Edit: Oops, forgot one important detail. The eagle is a cruiser. You just about always want either Dedicated Targeting Core or Integrated Targeting Unit on a cruiser or capital ship; they really make a big difference. Enforcer: I don't use enforcers, so someone else will have to offer advice here. Only thing I will say is: flak cannons are awesome point defense weapons; dual flak even more so (though regular flak is cheaper and usually plenty) - I'd consider replacing the light dual machine guns with flak cannons. Medusa: An excellent ship; especially survivable if you can add extended & accelerated shields. For anti-pirate work, I'd suggest a primarily beam setup - gravitons, tactical lasers, maybe a burst PD or two (I usually go with either the two rear side turrets, or the central rear turret & the two front small turrets). Perhaps add some small kinetic weapon in the front hardpoints - railguns, maybe? Alternately, fit it for a strike role - heavy blasters, some PD or tactical lasers, and as many vents & capacitors as you can cram in. Unstable Injector might also be a good call - let it get in & out of strike range a bit more easily. Play around with the simulator some, see what actually works; heavy blasters are exceptionally flux-hungry, and letting the AI use them could just be a recipe for a dead Medusa. Apogee: The Apogee is at its best as a flagship - under AI control it will frequently set its drones to roaming, letting them wander out of its shield bubble where they're much more likely to die. Still, even under AI control, it can do pretty well; just, in that case, you may want to favor more flux-friendly loadouts than heavy blasters or plasma cannon. For Apogee loadouts, I suggest looking here: http://fractalsoftworks.com/forum/index.php?topic=5446.0 - in particular, the first one in my post might be a decent template to work from. On the Hammerhead, I find that LR PD lasers are quite useless and prefer burst PDs much better if it is posible. And on the Eagle, I usualy never put anything in the missle slots to save on OP. The enforcers is really good with rockets instead of missles. The eagle would also need PD instaed of tac lasers and replace the anti matters with another energy instead. Everything else seems fine to me. For hullmods, Integrated Targeting Unit/Dedicated Targeting Core + Expanded Magazines are essential; I tend to max out on vents before adding in other stuff. I find that HVD's and Maulers pair very well together; same range, similar fire rates, and the HVDs also have the EMP effect for when they're hitting armor. The Enforcer can mount the HVD/Mauler combo too, but its low speed and lesser flux capability mean it's easier for enemies to swarm the unfortunate vessel. Thanks for all the advice, keep it coming! As for the Apogee, it looks... daunting. I think I'll avoid it for now and go for 2x Medusa and save money for all the weapon changes I need to make. Are all these weapons available at the Tri and Hegemony stations? Those 2 and the pirate base are the only places to buy weapons right? And there is no guarantee that they will be in stock, right? I'm playing vanilla, btw. If you have high tech and a lot of spare OP i suggest using Tactical Lasers on small energy slots and installing advanced gyros and PD AI. Tactical lasers in this setup are almost flak level good. If you can replace any and all Chainguns with heavy maulers... thay have a lot more range and pack a nasty punch with one shell making them far better than chainguns at destroying armor. You could also consider a par of thumpers for that hammerhead as they are suprisingly lethal with fast relaod on and remain very flux effectient. The enforcer works well with flak guns on the side medium balistic slots and heavy maulers. You could pach either MRM or Reapers on the missile slots i'm not sure if you can but a sabot launcher would work as well. The maulers work OKish against shields since they do a lot of damage at great range making them capable of overloading weaker shield generators on other destroyers or frigates. Eagle... did i mention i like heavy maulers? My setup was maulers on the front phase beam on medium energy slots and whatever PD i can afford. Also as i said before tactical lasers with PD AI are the best PD high tech can get since burst lasers have downtime and bad RoF when exhausted. In fact on larger ships with many small energy slots tactical lasers + PD AI can actually be cheaper than burst lasers since TL costs far less OP. As for the Apogee... get it by all means. 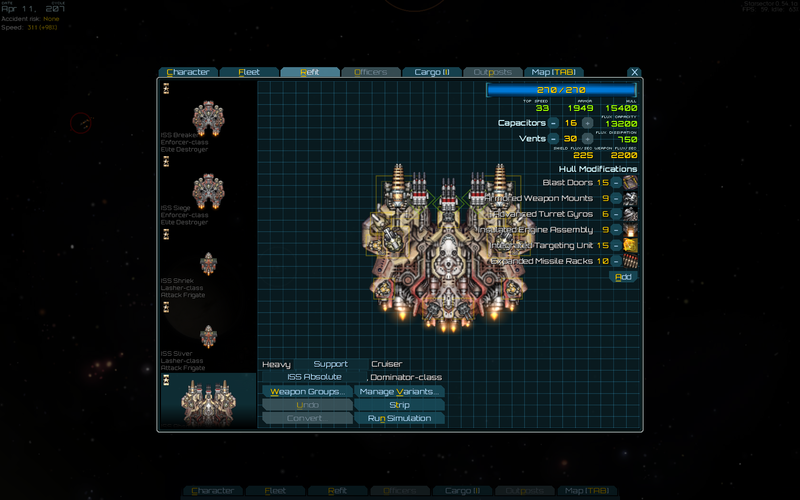 This thing is ludicrous as it can solo most pirate fleets on solo out of the box with almost no character skills. Where can I find Heavy Maulers? The Tri base only has the heavy needler. Also, I messed up (I think) with building my character, since I didn't really know what I was doing. I put all my points into Combat, and then just recently realized that I have to put points into Leadership/Fleet Logistics, otherwise all my new ships crash into each other. 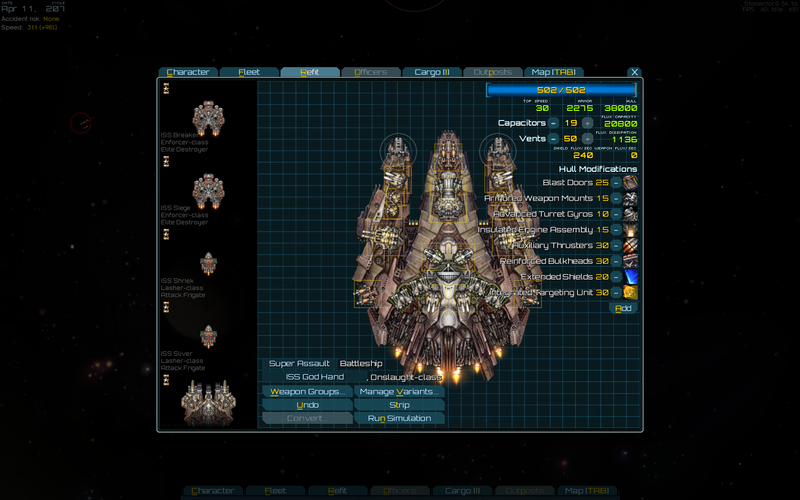 So, I don'[t have any in tech, and I can't really put any in there just yet because I still need more Fleet Points. Combat (7): All at level 5 except Missile Specialization, in which I have no points. I take it I need to start putting points into Tech so I can get the hull mods. Is there a level cap? Have I put too much into Combat already? Also, I don't mean to get too far off topic, keep the advice on fleet loadout coming! There isn't a cap per se, but somewhere around 20 aptitude points it starts getting very expensive to gain more - the farthest I've gotten a character (without cheating) is around 25 total aptitude points. Yes, the three stations you named are the only places to buy stuff; usually one of them will have some heavy maulers, but it can be random which one - there are some fixed deliveries of specific weapons, and then the game starts sending random ones to each station. If you've gotten Combat all the way out up to level 7 already, go ahead and get a full ten. Some of the level 10 perks are really, really good. The skill/perk names escape me right now, but the +25 FP perk in Leadership is also a good deal (the CP that come with the skill certainly don't hurt either). I usually goes with a Tech/leadership heavy build, but my recent run with a combat heavy build turn out to be surprisingly effective and fun. I would recommend maxing out "ordnance expert" and "helmsmenship" with their +10 perks. The perk from "ordnance expert" is like an extra +OP skill. The perk from "helmsmenship" is a game-changer as it give a great boost to your mobility and allows you to rush in with shield up. I always pick up the two skills that improve travel speed. Having good travel speed basically allows you to pick your fight. 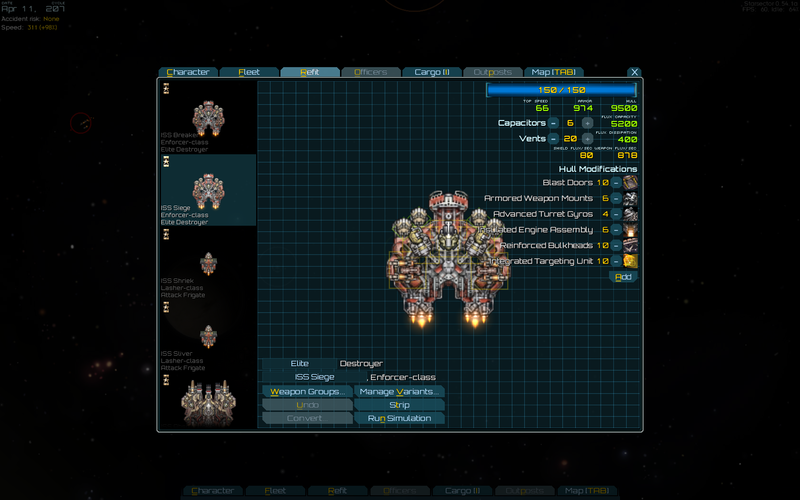 Picking which weapons to use on your ship depends a lot on what you're usually fighting against and the role you want the ship to take. Say Hammerhead for example, The setup with twin assault chaingun is good at chewing out frigates, however once you move on to fight against larger ships heavy mauler and hypervelocity driver would be a better choice. Okay, so I've refitted my shits and got an Apogee and got that all configured. Now I breeze through the largest of pirate fleets. Now it's time to turn half damage off, keep tearing up pirate fleets, and then save up to take on the Tri and Hegemony fleets! Shield busting and long range support is the name of the game for Absolute, a dominator-class heavy cruiser. She does it all: shield breaking with the hyper drivers, armor busting with the h mauler and annihilator rockets, and PD with twin dual flaks - the ISS Siege! Small but vicious, this lasher-class frigate can take down shields with the needler and then shred armor with dual assault guns and harpoons! Twin dual machine guns swat missiles. All of this is legit but does take a higher level character as you need to max the 3 OP granting skills but as soon as I got my first enforcer-class the game became easy mode. I currently have 2 enforcers, 2 lashers, 1 dominator and 1 onslaught and I can easily take out every fleet and only have issues with Hege Defense Fleets. Only ships I've lost after hours of play are the lashers that get overly aggressive and get too near to capitol ships found mainly in the TriTach fleets. My fleet does lack a way to rapidly acquire the capture points but I honestly don't even need them with my smaller fleet.